Sometimes we try out new things only to discover that while it is fun trying something new, the reality is that the one try is enough. Other times we try out new things and we say to ourselves, why have we not been doing this all along. 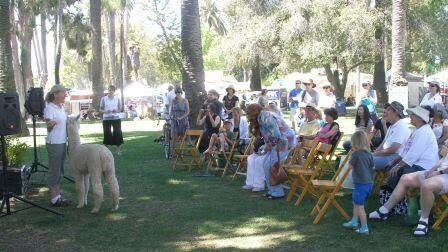 Such was the case for Alpacas at West Ranch and the CEC's Earth Day celebration. It was an absolute match made in heaven. We showed up on Saturday morning (after many, many emails back and forth with the wonderful Christa Backson of the CEC) with our portable pen, three adorable young males, products to sell, worms and composted "pellets", lots of really pertinent information and a hopeful attitude. One hour into the event, we knew we had made the right decision. Two days and probably 4,000 - 5,000 people later, we were certain (tired, but certain) we had made the right decision to attend this wonderful celebration. We met wonderful people who asked great questions about the animals. We were so pleased at the general respect for the animals and their space. The boys did not want to be touched, handled, etc. and people really seemed to understand. We were invited to give a 1/2 hour presentation about the animals and all the people who listened really seemed to enjoy learning more about the animals. It was great for West Ranch and great for the alpacas in general.